‘Fundamentals on Optical Sensors’ is a spring school addressing early career PhD students and professionals that are interested in learning about the basic techniques that enable the measurement of many different physical quantities by exploiting the unique properties of light. The academic lectures deal with the basic properties of light and optical signals, review the main light-matter interaction mechanisms, discuss most important optical devices such as lasers, photodetectors, and optical fibers, and explain how these can be used to construct optical sensor systems. The industrial lectures and laboratory sessions include examples of sensor systems targeting the measurement of important parameters such as temperature, distance and displacement, force and pressure and industrial applications thereof. Additional lectures deal with the importance and impact of Photonics – the science and technology of light – on our economy and society, and with entrepreneurship-related topics such as the basics of intellectual property right protection. All lectures will be delivered by established academics and invited industry experts. Attendees will be requested to present a poster about their research or professional activity and they will receive a certificate of attendance, which can be changed to ECTS credits, as well as on-line access to all course material. This course lasts for 4 entire days, and will also include 2 social events and one poster reception. The price of the training event is 240€. The training event includes a welcome reception, lectures by Professors and industrial partners, a poster presentation session, and a concluding party. 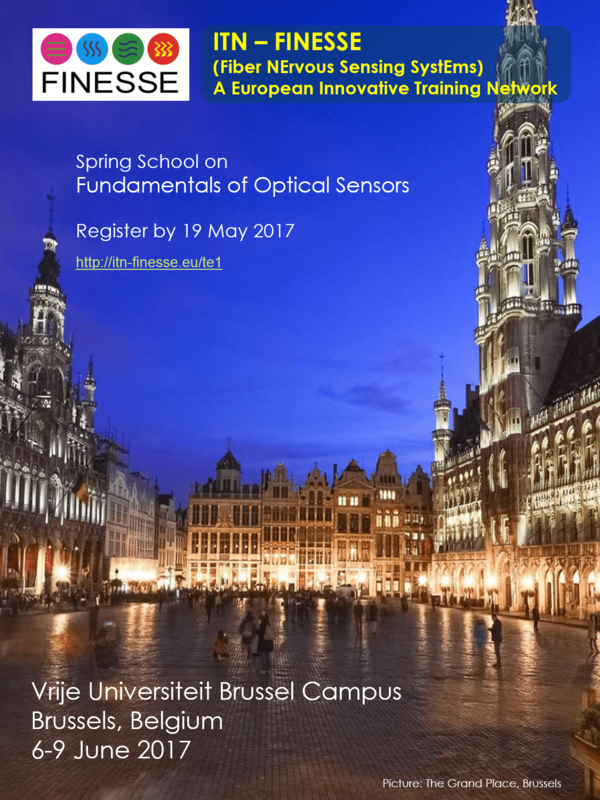 Spring School on Fundamentals of Optical sensors is the first training event organized by the FINESSE consortium. The spring school will take place in Vrije Universiteit Brussel campus during 6-9 June 2017. Click here to see the announcement. During the poster session, students are requested to present their current research work to all the participants. The poster should give an overview of how you see the subject of your research. The intention is that all participants learn to know each other and their research subject through the prepared poster. Kindly download the poster template. The local organizing committee is pleased to offer rooms with discounted rates at hotel Radisson Red, Brussels. The participants can use this link to reserve their rooms. In case of any difficulties, please go to https://book.radissonred.com/reservation/ and use the promotional code VUB17. The following link provides information on how to access the VUB Campus. The address is Pleinlaan 5, 1050 Brussels, so just across the Campus address which is Pleinlaan 2, 1050 Brussels.